Goodreads: Oh, how far she’s come…but how far will she have to go? Twenty-four-year-old Cheyenne Florian has just received the kind of job offer that dreams are made of. On the strength of a few vlogs, she’s recruited to be the new correspondent on the recently hatched Independent News Network, INN. With its slogan “Because independent thinking is the only way out,” INN strives to be exciting and innovative. Yet once Cheyenne joins the INN team, she’s disappointed to find age-old dynamics in play. A few of the female staff resent her meteoric rise, while some of the men are only too happy to welcome her. Even Edwin warns her to watch her back. And then there’s the diary left for her anonymously, written by a female broadcast journalist icon named Elyse Rohrbach in 1991. The mysterious diary is accompanied by a note, urging Cheyenne to learn from the past. Is it meant as inspiration and friendly advice—or as a warning? Still, she can’t see how it has anything to do with her…until disturbing events begin. Kritters Thoughts: This could be deemed the first book to come out of the #metoo movement and it seemed like it came out very fast. Cheyenne Florian is a journalist right out of college and she is presented with a one of a kind opportunity - to join a news organization that is going to be the new one in the field and should break all grounds and the mold for what news organizations should look like. I loved the concept of this book. I loved Cheyenne and her story. I am starting with the things I love because there were a few things that I didn't love with this book. I loved Cheyenne's internal dialogue about should she report the abuse, does she have anything to back her story and hearing how women hesitate to report things for many many reasons. I appreciated reading from her point of view why a woman wouldn't immediately tell her story and maybe even justify the abuse. What I didn't love was the story from the past that was told through diary entries. It made the cast of characters huge and confusing. I felt as though I could have enjoyed the book with just Cheyenne's story, the diary entries didn't add much. Each time I finished a chapter that included a diary entry, I started the next chapter thinking I could have skipped that and still enjoyed the full book. I also didn't love how Cheyenne unfolded the whole mystery in two pages. It was like snap your fingers and she knew the who what where and when and it just folded up too quickly for me. 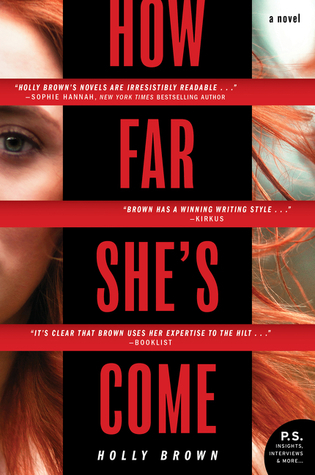 I am a Holly Brown fan, so I will still read her next book, but this is maybe not the one of hers that I would recommend to readers. Disclosure of Material Connection: I received one copy of this book free of charge from HarperCollins. I was not required to write a positive review in exchange for receipt of the book; rather, the opinions expressed in this review are my own.